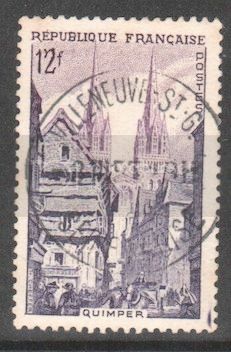 Still in Brittany, here a a 1954 stamp - SG 1208 - showing Quimper, an old town much ravaged during civil wars in the 14th century. Note the nice cancel on the stamp. 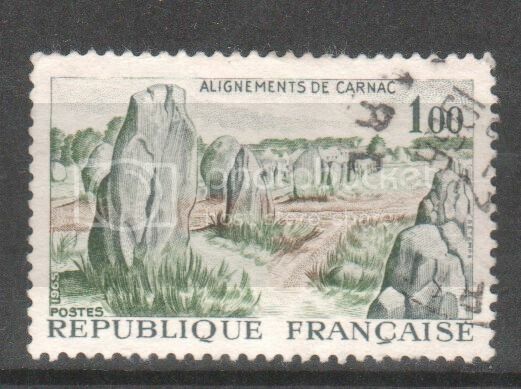 I could not find the exact spot for this stamp, but here is a picture of only one stretch of the stones. They go on, and on, and on for about half a day's walk. Just as you think you have reached the end, there are still more rows continuing into the forest. 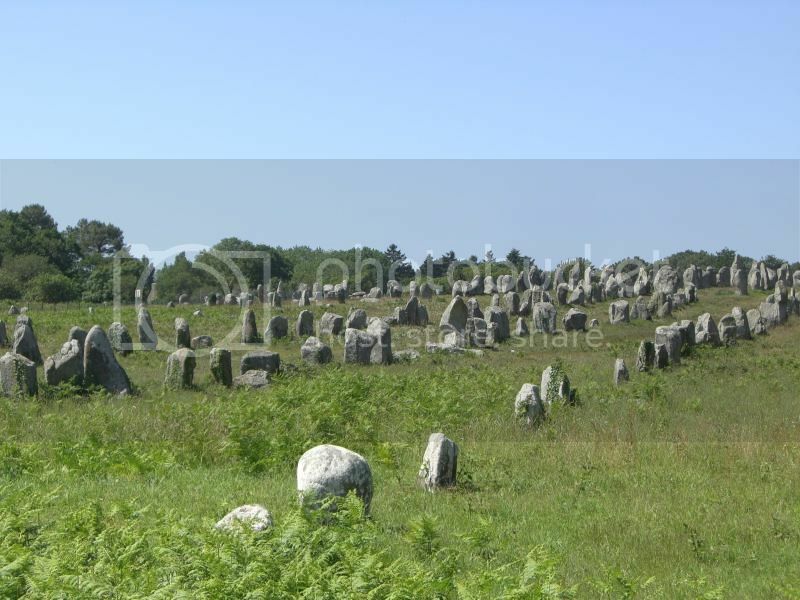 The surrounding woods are filled with dolmens and barrows. greaden Thanks for the great photos. Brittany is on my long list of areas I would like to explore. 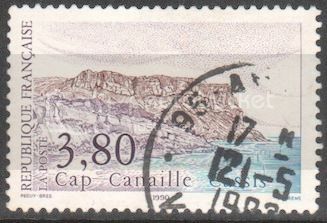 I thought we needed to stay in Brittany a little longer, so here is a 1946 stamp (SG 981) featuring the Pointe du Raz, a dramatic bit of coastline in Finisterre which is the second most westerly place France. A long way along the French North coast from Brittany is Dunkirk, near the border with Belgium, famous for the WW2 evacuation of British troops. Originally a fishing village, walls were added in the mid-10th century to protect it against Viking attacks. It changed hands several times during the following centuries. In 1658 it was briefly awarded to England as a reward for helping the French defeat the Spanish; but in 1662 Charles II of England, who was always in need of money, sold it to the French for £320,000. The French improved the fortifications. The famous Man in the Iron Mask was arrested in Dunkirk in 1669: nobody is certain who he was. In the following decades Dunkirk became a base for privateers. The town was very heavily bombed by the Allies during WW2. Here is a 1962 stamp (SG 1566) showing Dunkirk, issued to commemorate the 300th anniversary of the definitive French acquisition of the town. Keeping watery, but this time inland, here is a 1965 stamp, SG 1685, showing a yacht at Aix-les-Bains on the Lac du Bourget in the Savoy. The place was a spa resort visited by European rulers in the 19th century, and a museum there has a major collection of Rodin sculptures and impressionist paintings. Back to the seaside, and the North coast of France, for a trip to Le Touquet Paris-Plage on a 1962 stamp, SG 1550. This is a fashionable holiday resort with luxury hotels, frequented by many better-off Parisians. During World War 1 there was a hospital for wounded British troops there. The playwright, actor and singer Noel Coward spent weekends there between the two World Wars, and P G Wodehouse of Jeeves fame lived there in the 1930s. 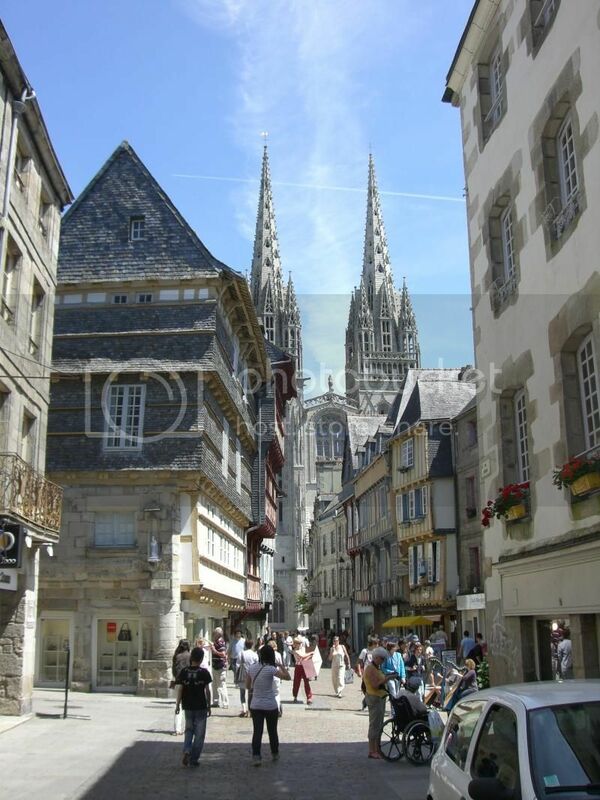 The town is well-known in France for its seaside architecture. What is all this about a driver?!?!? My friends below are very angry. They came here on the promise of a Tour de France, and when they arrive everyone is piling into a coach! Quelle paresse Britannique! A bas les autobus! 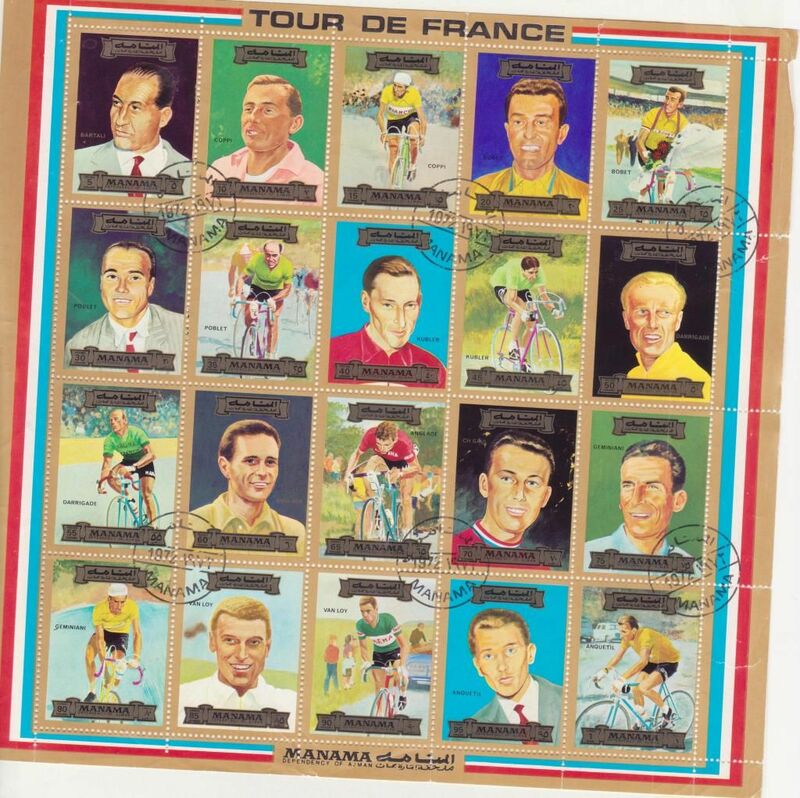 Vive le Tour! Back in the saddle - note, rayb, not the driver's seat - for a stop at Évian-les-Bains, spa town in Eastern France, on the shores of Lake Geneva, where the Évian mineral water widely sold in France comes from. SG 1356a. Back to the South coast of France - I believe in making the cyclists toil - to see Cap Canaille, the highest sea cliff in the country, rising to almost 1300 feet, on SG 2976 of 1990. After all that journeying, we need some wine. So another long stretch of cycling to the Bordeaux region, one of the main wine centres of the world. Wine has been produced there since probably the 1st century CE. A 1955 stamp, SG 1262. Quite a way North of Bordeaux, on the French West coast, is Saint-Nazaire, an important port on the estuary of the Loire. Tradition has it that in the 6th century the main church there housed the relics of St Nazarius, a martyr: a Breton chieftain tried to seize the relics, but was deterred when the man he sent for the wicked task tripped and fractured his skull on the lintel of the church door. During World War 2 the town was a U-boat base. 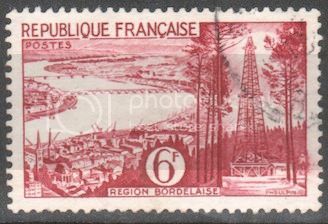 In 1975 France issued a stamp, SG 2095, to mark the opening of a bridge across the harbour. The Loire is famous for its chateaux. 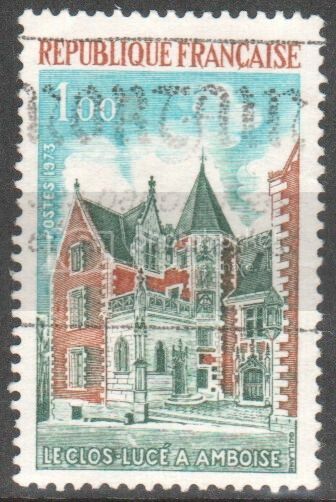 Here is the chateau of Sully-sur-Loire on a 1961 stamp, SG 1545. It was built to command one of the few places where the river could be forded. It was the residence of the Dukes of Sully: the first duke (1560-1641) was chief minister of the French king Henry IV. Also on the Loire is the Chateau de Gien, which is now a museum dedicated to hunting. It was built in the late 15th century for Anne de Beaujeu, the elder caught of King Louis XI. From 1483 to 1491 she was Regent of France, while Charles VIII was a minor, and she supplied troops to help Henry Tudor, the future Henry VII of England, defeat Richard III in 1485. Among other things, Anne is credited with encouraging young aristocrats to use handkerchiefs rather than fingers to wipe their noses. Here is the chateau on SG 2007 of 1973. 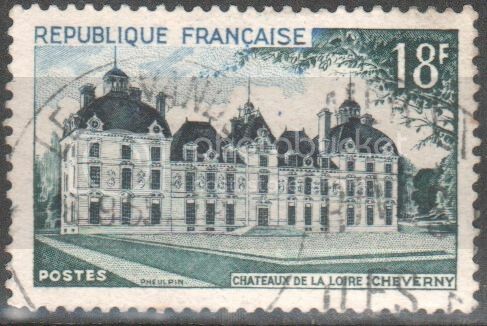 Another of the Loire chateaux is Cheverny (1954, SG 1210), built in the 17th century and used by Hergé as the basis for the Château de Moulinsart (Marlinspike Hall in the English translations) in his Tintin books. The Chateau de Chambord is the largest of the chateaux of the Loire. It was built in the 16th century as a hunting lodge for King Francis I (some hunting lodge!). During World War 2, treasures from the Louvre and elsewhere were stored there for safety. Here it is on a 1952 stamp, SG 1144. 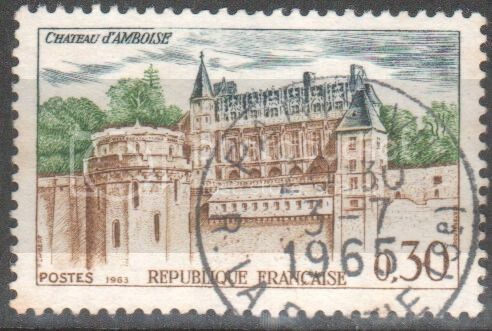 Still in the Loire valley is the Chateau d'Amboise (1963, SG 1619) which became a royal residence in 1434 as the price of the pardoning of its owner, Louis d'Amboise, for allegedly plotting against the French king. King Charles VIII died there in 1498 after hitting his head on a door lintel. Mary Stuart, queen of Scotland, spent much of her childhood there. 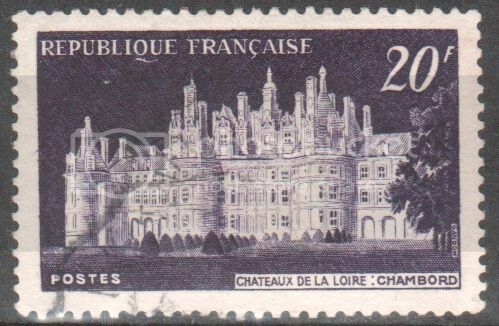 Also in Amboise is Le Clos Lucé, featured on a 1973 stamp, SG 2008. Dating back to the 15th century, it is most famous for being where Leonard da Vinci lived from 1516 to his death in 1519. It was also where Marguerite de Navarre (1492-1549), sister of King Francis I, wrote the Heptaméron, a collection of stories inspired by the Decameron of Boccaccio.